All Saints’ Church has recently been accepted as a the first Church community partner in the Northamptonshire Music Education Hub. The Hub has been set up to promote the music making of young people in Northamptonshire in partnership with other Hub members and with the Northamptonshire Music and Performing Arts Trust, known as NMPAT, at its head. In the coming months details of how this partnership will manifest itself will be announced, but one of our shared musical talents is linking the two in a fundraising venture. 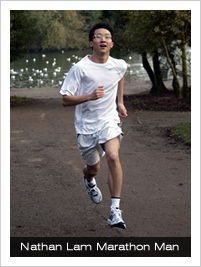 On 28 April 2013 our Organ Scholar Nathan Lam will be running the Greater Manchester Marathon to raise funds and awareness for both NMPAT and the Friends of All Saints’ Music. background, I could never have envisaged that I would have the opportunities I have had. From performing with the county choirs and orchestras at prestigious venues across Europe, to directing choirs on tour and on CD recordings, I know how beneficial music can be to a young person. Through this fundraising appeal, I hope to do my part to help future young people, regardless of their background, have the opportunities that I have been so fortunate to have benefited." You can support the work of NMPAT and FOASM by sponsoring Nathan by clicking here. If you are a UK taxpayer, it is likely that Gift Aid can be added to your online donation (25 pence for every pound donated) at no extra cost. 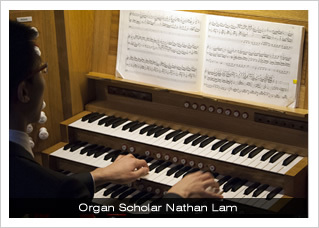 You can also sponsor Nathan by signing the form in the Narthex at All Saints or in the office at NMPAT.